Want authentic smoke house flavor? The Weber Smokey Mountain Cooker Smoker 18.5 Inch is the right smoker for you! This is the exact smoker which has won me 20+ Grand Championships since 2008. I regularly go up against smokers costings $15,000+ and this $299 unit is a winner in the right hands. As part of my giveaways, I’m offering this pit to one lucky winner. Must be a continental US resident to participate. See Giveaways Rules for more info. heavy-duty plated 18.5 inch cooking grates, a built-in thermometer, aluminum door and legs, and is packed with a premium grade cover. Weber lifetime warranty included. Note: Previous winners of this giveaway are not eligible to win this giveaway twice. I love smoking (meat, that is!). 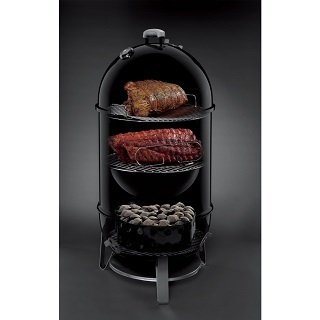 My current smoker is in desperate need of a replacement – this would be an awesome win for me! Awesome contest…Been looking at all possibilities when it comes to smokers(BBQ-Smokers that is)I too, have also been raised with a Weber – time to branch out! Good Luck to all of us! Oh my goodness, how cool would this be? I would love to have one, I have just never been able to afford it! Love it, want it, win it! NEED a smoker like this bad! Thanks Harry for the opportunity. Great prize! Not a dumb question. It just means that you cannot win the same item again. You absolutely can enter all the other giveaways. Ours is over 20 ears old. Are would like this for smoking meat. Would love to have one, I used to sale them at Emighs Hardware. What an AMAZING giveaway! I would probably never need to go to another BBQ restaurant again if I won this LOL! Thank you to Harry and everyone else at Slap Yo Daddy BBQ! Very excited to have won this WSM. Can’t wait to try it out! Hope to win, never won and thanks for giveaway. Hubby and son would love this! Oh yea Big Daddy that the way to go! When do winners get announced for smoker giveaways? Congrats to all of the winners!! Enjoy! !